FOUR people have been arrested following a police chase that started on the Sunshine Coast and ended with a major Bruce Hwy pile-up. A Queensland Police spokeswoman said after a traffic crash at Nambour about 11.50am, one vehicle evaded police and sped south. 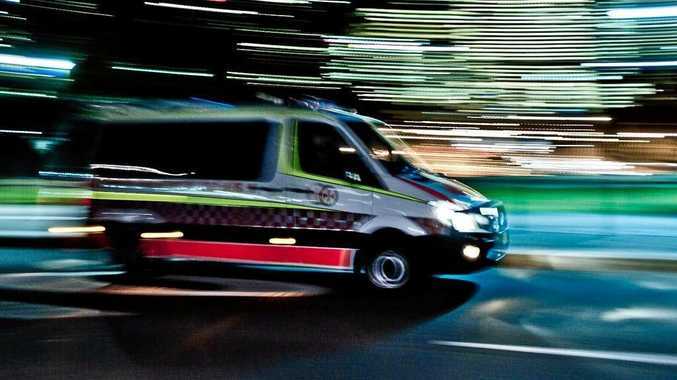 The driver of the wanted vehicle reportedly almost hit another car as it was speeding away from police on the Bruce Hwy. "The driver nearly took out my daughter and granddaughter!" Candy Patterson wrote on Facebook. 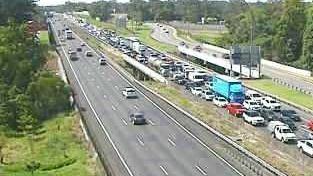 Police deployed stingers on Steve Irwin Way and chased the vehicle where it crashed near Burpengary, blocking traffic on the southbound lanes. Some witnesses reporting up to five vehicles were involved in the pile-up. "My mum was shaken as she almost got taken out by him on the highway, but he swerved out and hit the cars up the front of her unfortunately," Sharni Bennett said. "Idiot in a dark grey car flew past me then crashed into other people with police chasing," Jess Hutchison said. The QPS spokesperson said four people were arrested following the crash, two men and two women. Traffic was blocked for over an hour before it returned to normal speed.